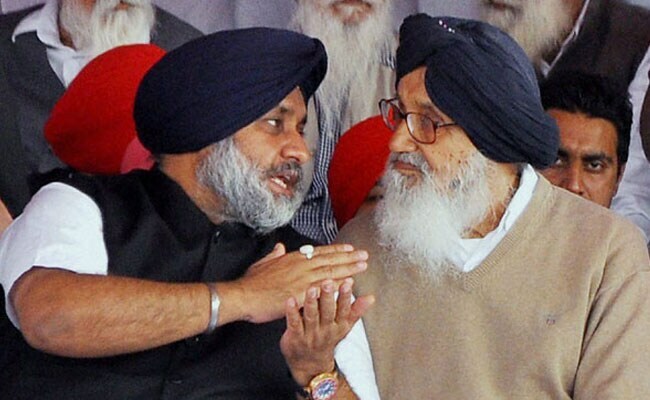 Election of Sukhbir Badal was made unanimously by members of the party with Parkash Badal. Chandigarh: Shiromani Akali Dal (SAD) president Sukhbir Singh Badal was elected legislature party leader of the SAD today. Former chief parliamentary secretary and Adampur MLA Pawan Kumar Teenu was elected chief whip of the legislature party. This was decided unanimously by members of the legislature party in a meeting presided over by party patron and former chief minister Parkash Singh Badal. The members brought on record the services rendered by SAD president Sukhbir Singh Badal during the last 10 years and also appreciated the development done during SAD-BJP rule. They said the party would play the role of a constructive opposition under Sukhbir Badal's leadership and continue to work for the welfare of Punjab and Punjabis. The Congress has returned to power in Punjab with a huge majority, winning 77 seats in the 117 member assembly. The Akali-BJP combine, which was in power for 10 years, was reduced to number three, after the Aam Aadmi Party (AAP), which won 22 seats.